I doubt that as it would be cheap and simple to rework the sword. "killing" the weapon seems much more likely for religious or superstitious reasons is more likely and was done for centuries before viking times as well. From my reading on the subject, swords were reckoned to be about the equivalent of buying a small car these days, so were a common target of grave robbers. Then again, given the lack of unbiased written history, and how speculative archaeology is, the deliberate breaking could be for religious reasons as you say. Does it look odd to anyone else that the sword in that picture looks like strapping or flat bar? I mean usually you'll see corrosion of a blade where it can wear a thin edge down but I don't see it corrode flat on an edge. Just an observation that looks strange to me. Looks to be very dry, well drained soil. Likely a low acidity too which would help with the preservation. Daswulf, the thin edge section could have been a welded in piece more susceptible to corrosion or the thinnest section could have just corroded away first? Just speculation. 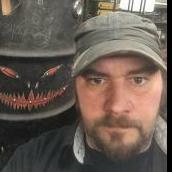 JustAnotherViking, I was elated when those photos were first published! I would love to own that axe. Any of those pieces really but that axe, wow! Frosty, I have spent large chunks of my free time speculating about the Seax shape. 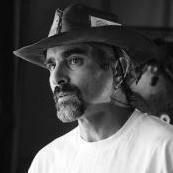 The first time I saw one was at a Mountain Man rendezvous in the mid west in the early 90s. I had always liked the Wharncliffe blades the Case company would periodically issue on some of their folders but the Seax profile sets itself apart enough to be a whole other animal. The guy who was wearing it at the rendezvous told me what it was and it's been on my mind ever since. At times I'm struck by the visual similarity of the general blade shape to the shapes of the Futhorc runes. Intersections of straight lines...it's probably purely coincidental but...? So your reading would indicate it wasn't bent to deter grave robbers as that would be like breaking a window of your car to prevent car theft?----Not enough damage to make a big difference? Now if it was a famed "named" sword such condition would discourage theft I believe. I could probably restore that blade to using condition in a day given a viking period smithy. I note that it had been in using shape with guard and pommel installed. I can't tell if the edge thickness was an artifact of preservation, done ritually or what? I think we're getting our wires crossed. Bent isn't normal. Shattered into pieces is normal. I find this discovery odd due to it being bent rather than shattered. Actually if you search on bent viking swords and broken viking swords you will find that bent seems more common. 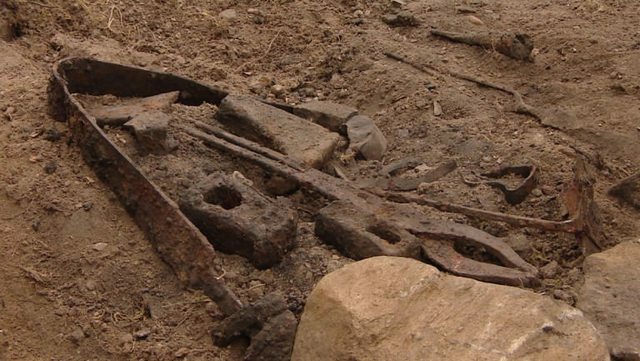 Also look at the large number of Celtic blades that were deposited bent. An article on this find mentioned the remains were cremated, so the possibility he was burned with his sword then the swirl was bent after? Then again I watch too many movies and don't read enough books on the subject. the flatness of the edge confuses me more but the world may never know. Thomas Powers: I'll do some more reading on the topic. You are likely right, so I'll bow to your knowledge. I don't recall seeing bent examples in any of the museum exhibits I've visited. They were either mostly intact or in pieces, hence my thoughts on the matter. 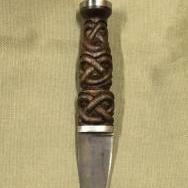 From my POV having documented a few original seax it is pretty clear (to me) that the form is a stylistic one. The fact that the broken back shape exists on seax with blade lengths of 2inch up to great big woppers that are as big as big swords, would lead me to this conclusion. The shape and material distribution of the seax would lend its self to a medium to big knife, with the majority of the mass at the broken back , in the position to put it behind the point of impact (giving a chop quite like an axe). Often the blades taper in all directions from the broken back, this again puts the thickest part of the blade where it is also widest. There is also the Very useful pointy point. The larger seax possibly performing the job of a war sword, made fro the chaos of battle where the daintiness of a thin sword would be surpassed by the brutality (and ruggedness) or a large seax. The majority of seax ar predominantly made of wrought iron with small amounts of steel at the edge, I think this is probably why some of them are so thick. The uniformity of this shape through a range of sizes makes me feel that the seax has symbolic element to its form. either as a homage to someone / something (in other words a fashion statement, if the king has a silly looking knife then so must I..) or as symbol of someones region, clan or culture... The shape of a 2" broken back seax makes less sensefrom a p[ractical POV unless you are keeping to a defined form of some kind. As you travel around Europe knife shapes change from region to region, sometimes with good functional reason and sometimes to define one group of people as opposed to another. I find the seax fascinating...At first they seem to be an ugly knife ,but upon closer looking are very elegant with their own set of stylistic rules. The seax reminds me a lot of the Japanese aesthetic....but at a different place and time. I feel an affinity to the seax as a knife with a temporal connection to the past on this little island I live on. 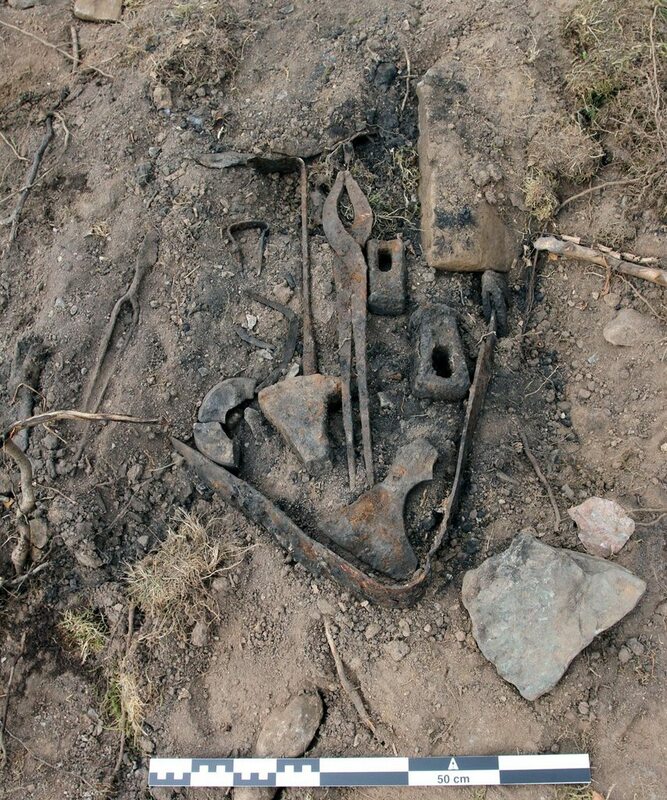 Take a look at the article "Killing the Weapons: An Insight on Graves with Destroyed Weapons in Late Iron Age Transylvania", available on Academia.edu. Lots of good info, with references to other scholarly works for further reading, should you be so inclined.. I'm wondering if the shape of the blades might have been something simpler. 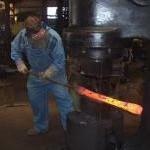 If you hammer in a bevel on a piece of metal it thins on the cutting edge and the spine begins to curl. You straighten the blade and continue. When you are done straightening you'll end up with something resembles a seax. Could it be that simple? I don't know but I love them as well! definitely not...trying to forge the complicated geometry of a seax is anything but simple and requires a pretty strict set of procedures to get the shape.....It wont happen by happy accident. I'm with Basher on this one. I've been doing a bit of reading and research into this knife form and found that it is anything except a simple design. The broken back is also something of a later development as very early Seax were more like a dropped point than a clipped point. Having tried my hand at making one, it is no simple task. As for the bending of swords in graves, I remember reading something (possibly in Beyond the Northlands) about the reverence and respect the Viking culture had for their swords. There were more than a few inscriptions that read something like "rather than have a dishonorable or cowardly hand upon you" explain the bending of weapons upon burial. Remember too that these were handed down from father to son, mother to daughter over generations. When there was no one to inherit the item, it went to the grave with the last of the line. One theory about why bent rather than broken, is that anyone capable of actually straightening and restoring the sword would also have the same reverence and respect for it that the last/original owner had. Thus it would doubly protect the sword from cowardly or dishonorable hands. The bent sword is unusable. The broken one still has a portion that could be used. Late addition to the thread re tongs: I once heard an Islamic tale that Allah gave the first smith the first tongs because while you can use rocks for hammers and anvils you need a pair of tongs to make a pair of tongs. As scientifically advanced as American culture was in the late 20th century I wonder why a big name medieval scholar would publish that old "urban legend" about medieval armour being so heavy a knight had to use a crane to be lifted onto his horse. Yet it's in Norman Cantor's Encyclopedia of the Middle Ages. If it ain't true it should be. I remember seeing a crane installation of a knight upon a horse. I saw it, many years ago, in a movie I cannot seem to remember. Perhaps said knight was very overweight. Please note that "Weightwatchers was invented several centuries later. What I have noticed about Hollywood is the tendency to *always* go to fantasy even when the reality would have been just as good if not better! Hollywood rarely budgets much for consultants. They tend to wing it with preconceived notions, well conceived ignorance, and dynamic misinformation, et cetera. A few producers are exceptions. Steven Spielberg is one of them. He hired Dr. Horner as scientific consultant for Jurassic Park, and it shows. It garnered more than a billion dollars in total revenue. Now as to 19th century USA chinese criminal organizations; I like sucker rod to make them---or Titanium.